Our employees are supposed to book their appointments at least one week (7 business days) in advance. Is there a way that when they click on the calendar that it only shows days seven days out or later? can we also block Saturday and sunday? This seems to be something that idarkhorse can do. We do not have built-in selection date limit options (except 'Disable Past Dates') on form tools. 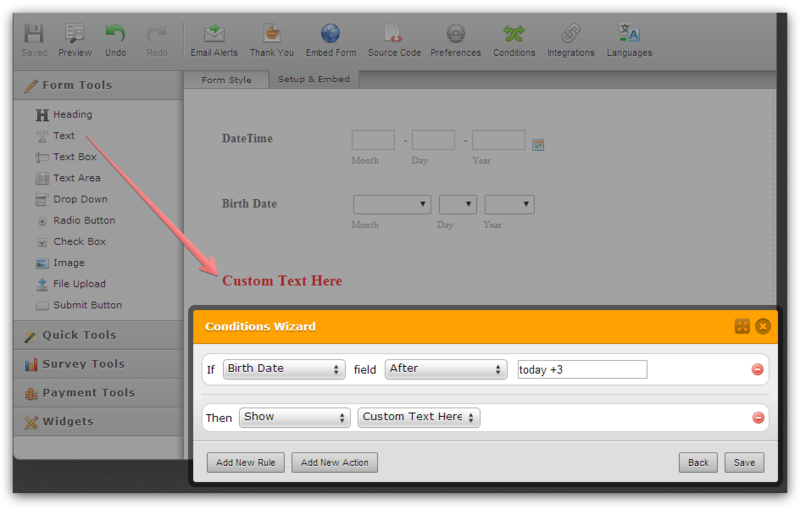 In case you can use a DateTime field and/or a Birth Date Picker, it is possible to use date based conditions. It is not likely that we can provide a custom solution for the Date Reservation widget since it is being loaded in iFrame and we can not affect it. We can submit a feature request ticket, but we will not be able to provide a ETA for when it will be implemented.